Welcome to the final week of our Christmas in July Blog Hop where a group of talented ladies featured awesome holiday ideas every Wednesday of this month. I've truly enjoyed participating and having all of you share with us in this event! 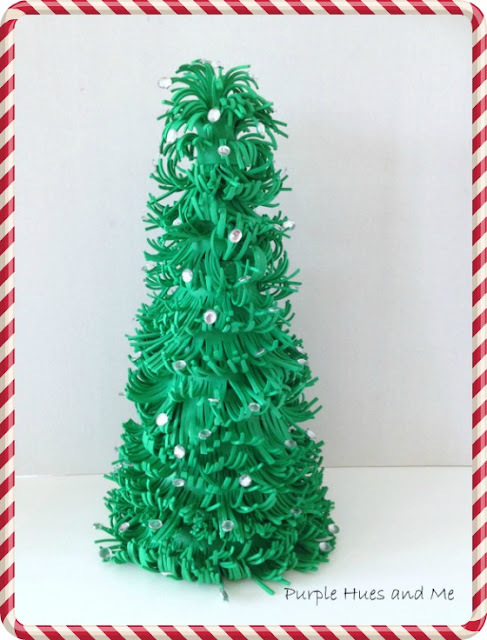 The Christmas project I'm sharing with you this week is quite easy and inexpensive to make! It's what I call a faux pine xmas tree made out of foam sheets! Yes, foam sheets! I love making crafts using foam sheets. You can easily manipulate the foam into something beautiful! The base is a 14" cone shaped cardboard you can either buy or make, like here. I already had one on hand, so I just painted it with green acrylic and let dry. I used two - 12"x18" foam sheets that I divided into 8 - two inch wide strips and cut out. Then I made small slits in the strips, leaving a border at the top. To speed the cutting process up, because it can get drawn out, instead of cutting eight, 2" strips, I cut four, 4" strips and folded over each one and cut the slits toward the fold. Once finished cutting the slits, cut along the fold, separating into two inch strips. Lay the strips on a medium warm flat griddle or an iron propped up for a flat surface, just for a few seconds for the slits to curl. If the strip is too long, lay on partially and lift up each section once curled, until complete. *If there is too much curl, turn strip over on opposite side for a few seconds to relax the curl a bit. Begin hot gluing the strips on the bottom of the cone, going round and round . . .
Stop about three rows from the top and begin gluing on strips curling in the opposite direction or upside down . . .
continue until the top is filled in and the tree is completely covered into a frilly little pine! Hot dang!!!! For a festive look, randomly add stick-on rhinestones! Makes for a lovely tabletop holiday accessory! And only for a few dollars! And join the party by linking up your favorite Christmas post! Gail, this table top tree is adorable! Thanks for the tips about curling the foam with a hot surface. What a pretty Christmas decor piece! Gail, I love this! You are so creative with foam sheets and I'm amazed at the ideas and projects you share. I'd love to have one of these pretty trees in my collection. sparkles on the tree! woot :) Lovely foam tree, perfect for decorating the home or office. Each kid used to have their own tiny Christmas tree in their room - one of these would have been much easier to put out! Thanks for sharing the tute! Gail, I did not see that coming. I had no idea what that green stuff was, I just know it looks great!! The sparkes add bling to this pretty project.